It’s at the second story that it’s clear this isn’t a book for small children. The first page of the third story is where actual chills start to set in. This book made me shudder. Scooby-doo it aint. 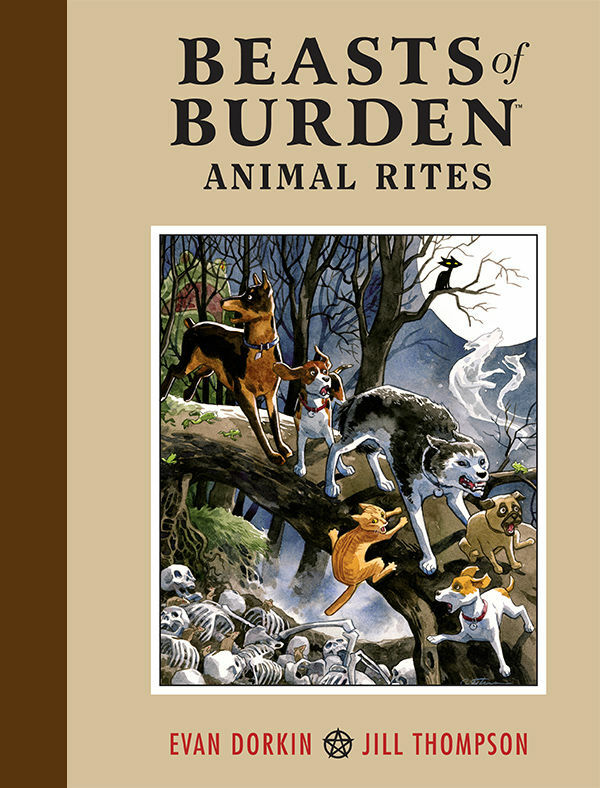 We’re taking a look at Beasts of Burden penned by Evan Dorkin and illustrated by Jill Thompson. I purchased this book on a whim some time ago, using it to fill an Amazon cart. I figured that based on the names involved, it was something worth reading. I somehow missed that the early work here had won two Eisner awards for Best Short Story and Best Painter. Note: If you ignored the brief note up top about spoilers, I want to mention that this book builds quite well and you may do yourself a slight disservice by learning too much before reading it. My experience with no prior knowledge may be one of the best ways to dive in. The first third of the book collects three short stories from Dark Horse anthology collections, with a four issue miniseries following it. It’s all served up in a beautifully manufactured hardcover – with no dustjacket, which I always like – and garnished with a small afterword and behind the scenes section, including some very nice full page wordless reprints of Thompson’s cover illustrations. Dorkin has written a variety of weird and wild work. DC fans may know him from his contributions to Bizarro Comics and Bizarro World, or the Superman/Batman: World’s Funnest prestige. His best known work is probably Milk & Cheese from Slave Labor. 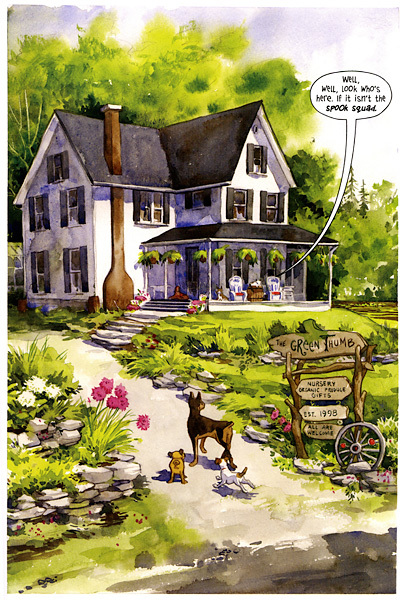 Jill Thompson, of course, is an artist that I was introduced to through her work on Sandman with Neil Gaiman – something I’m sure I share with many readers. She illustrated the Parliament of Rooks story and Brief Lives. Her resume is long and impressive, but Dorkin mentions it was her watercolored Scary Godmother books that made him beg her to work with him on this project. Together, they build a world where the innocent seeming animals of Burden Hill are the only thing keeping the forces of darkness at bay. Barely at bay, perhaps. 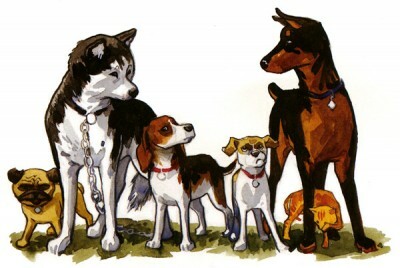 The first story introduces the core of our mostly canine cast, a group of neighborhood pups (and one stray cat) investigating a haunted dog house. From the outset, the creators show us several distinct personalities reminiscent of classic do-gooder gangs: The calm and confident leader, wise mentor, lovable outsider, posturing strong guy who is quick to spook, and of course, grumpy skeptic – they’re all here in animal form. It’s a technique that lets us become immediately familiar with the set up and opens us to the more subtle storytelling that permeates the volume. The writing seems very modern and straightforward, sometimes almost to a fault, but I’ve decided that it’s a strength – the book is easy to read. A voice guides us into the story and wraps it up, giving a feel of classic campfire narration. I had a brief nostalgia hit when it reminded me of the existence of the Bunnicula series, which I listened to on tape as a kid (while I was supposed to be sleeping) also starring a group of household pets in some pretty silly paranormal situations. So, there are times when it appears that these could be stories you’d tell to your children (and those with older kids or particularly intelligent youngsters may decide they can handle this book.) It’s perhaps slightly more vulgar than Scary Stories to Tell in The Dark, something that kept me up late many a night and certainly added texture to my childhood. And Sandman, another “mature” comic, is highly recommended to teenagers – there’s nothing here that’s worse than there. 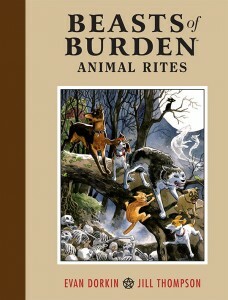 Nevertheless, you’ll want to read Beasts of Burden through yourself first. And not just because it’s irresistible (I told myself I got it for my fiance, the animal lover in the household, and would let her read it first this time. The cover enticed me in after a day of silent deliberation.) There are elements that would give this book an R rating as a film or require it to play on HBO as a TV show. But it’s also a set of beautiful and humanizing tales. Domesticated animals bring out a softer side in many of us. Someone used to seeing the deaths of of countless people on network TV may cringe instantly at the thought of a roadkilled puppy. These particular animals also have easy-going relatable personalities. It all serves to draw you in and place you slightly off guard – it quickly becomes apparent that this is a dangerous world, but these are true innocents. It’s perhaps a credit to Dorkin and Thompson that I’ve come away from this book with such affection for the cast. I’m not a dog person (we own two cats) so I may have missed some non-verbal cues from part of the cast, but they included several cat-agonists as well – I assume to placate feline preferring people like me, who must make up a significant portion of the horror comic reading population. 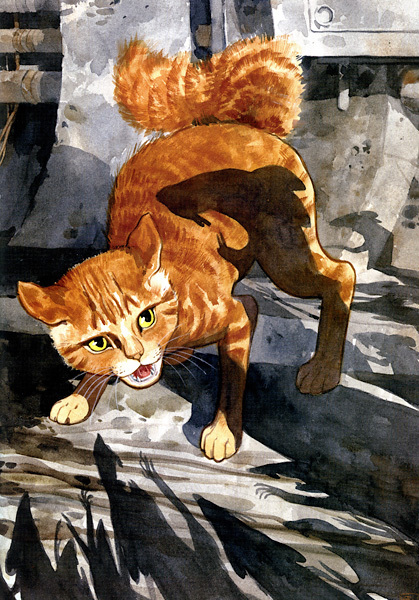 The interactions between everyone kept me from being too biased against anyone, but I have to say that the first name I learned was Orphan, that of the stray cat. I’m slightly ashamed to admit that I’m still a little unclear on the names of several of the dogs in the Burden Hill gang. I recognize Ace and Pugsley the easiest, and Rex was relatively easy to confirm, but I still have trouble with Jack and Whitey. Some of this is because I’m terrible at identifying dog breeds (I think jack has floppier ears – maybe Whitey is a terrier? ), much of it is probably because I was drawn so strongly through the story – a flip back a few pages would probably cement them for me, but I couldn’t resist going forward at a quick pace. My second time through was just to spend more time with the art. It’s amazing – no need to mince words here. The pages are beautifully painted in watercolor, with particular care paid to the expressions of the cast (body language included.) A single page can contain meticulously detailed realism and exaggerated humor without the switch between the two seeming jarring. I could write another thousand words just on the intricacies of the art and how it plays with the unassuming script, but I hope the included scans can speak for themselves without spoiling too much. The creators have put together something really special here. It starts out with relatively stand-alone stories, and the general plots are done in one, but by the end the book is set up for quite an ongoing arc – which I didn’t really expect at the outset, but I found myself welcoming. If you somehow can’t make up your mind, I’ve posted a link to the first 8 page short story from this book over in Uncle Gorby’s Corner of Free Stuff. There is no existing continuity for this title, but I like to think that it could take place in a corner of any well known paranormal universe – Hellboy, Buffyverse, Vertigo, etc. If they release more in trade, this will be a good place to start anyway. No prior reading required. But if are a fan of any kind of scary story or animal story, this book should be on your shelf. If Beasts of Burden leaves you slobbering for more (like me) you might want to pick up the recently released Hellboy crossover. I’m personally crossing my fingers for it to appear in the next Beasts collection, which I sincerely hope is in the works. 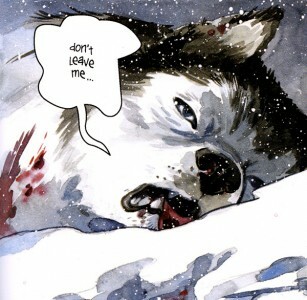 If you can’t wait for more animal tales from Dorkin and Thompson, checking out some of the other well known Dark Horse titles might fill your needs. Start reading Hellboy or the Buffyverse. There’s a Dawn story in the Buffy The Vampire Slayer Omnibus Vol. 1 that I know you will enjoy. Now if you’d excuse me, I’ve got to spend some quality time with my own little kittens, one of whom is on my lap pulling on my beard in an attempt to get my attention. I may pick this up if I can find it because it reminds of a few things. Mouse Guard for one. Watership Down / Fievel for some reason (I haven’t read a word of the plot). and I’m a huge Disney fan and this looks like Disney but dark so why not! ahhhh, Fievel. Philly! Philly Mousekawitz! Man, that movie. It’s probably closer to Watership Down, maybe Mouse Guard. That’s a title I’d like to read at some point.